Solid brass cranked door pull handle. In 228mm (9 inch) and 306mm (12 inch) sizes. Solid cast brass door pull handle on plate. Size 303mm x 53mm, handle length 195mm, projection 54mm. 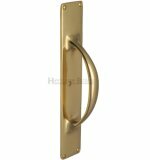 Large solid brass door pull handle available in left and right hand versions (image shows right hand). Size 457 x 76mm, projection 90.5mm, handle length 334mm, backplate thickness 4.5mm. Victorian bow door handle pull. 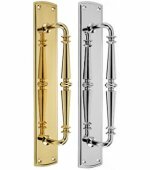 Available in 152mm size, in Polished Brass, Polished Chrome & Satin Chrome. Studio H pull handle in solid brass with concealed fix 51mm diameter rose. Available in 6 inch (150mm), 9 inch (229mm), 12 inch (305mm), 15 inch (380mm) and 18 inch (450mm) centre to centre sizes, 71mm projection. 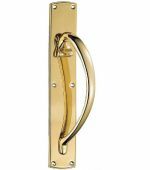 T door pull handle in solid brass with concealed fix back rose. 278mm length, 78mm projection. 316 Grade Satin Stainless Steel mitred pull handles available in 19mm & 30mm diameter sizes, in 225mm, 300mm, 450mm & 600mm centre to centre fixings. 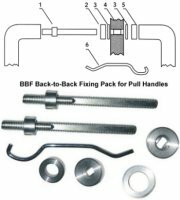 Supplied as single pull handle with back fixing bolts in satin stainless steel. Matching 50mm diameter x 6mm back rose packs avialable - supplied in pairs. 304 Grade Stainless Steel D pull handles available in 19mm & 22mm diameter sizes, in 150mm, 225mm, 300mm, 450mm & 600mm centre to centre fixings. 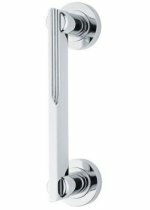 Supplied as single pull handle with back fixing, available in Polished Stainless Steel & Satin Stainless Steel. Matching 52mm diameter x 8mm back rose packs also avialable. 316 Grade Stainless Steel T pull handles available in 19mm, 22mm, 25mm & 30mm diameter sizes, in 225mm, 300mm, 450mm, 600mm & 1000mm centre to centre fixings. Supplied as single pull handle with back fixing bolts in satin stainless steel. 304 Grade Stainless Steel T pull handles available in 19mm & 22mm diameter sizes, in 450mm & 600mm centre to centre fixings. Supplied as single pull handle with back fixing, available in Polished Stainless Steel & Satin Stainless Steel. Matching 52mm diameter x 8mm back rose packs also avialable. 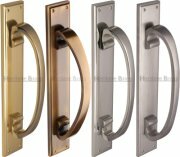 Solid brass flush ring pull handle available in 38mm x 50mm and 50mm x 63mm sizes. 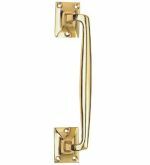 Solid brass flush fitting pull handle. Size 102mm x 45mm, 10mm depth. 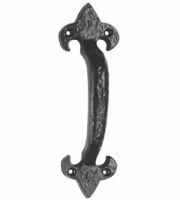 Ludlow Foundries black iron antique finish door pull handle. Available in 135mm, 180mm and 235mm length sizes. Ornate solid brass door pull handle on backplate 65mm x 382mm. Back to back fixing kit for the stainless steel door pull handles to fit back to back on the door. Available to fit 19mm, 22mm, 25mm and 30mm diameter pull handles.